The world's best-selling electric car, the Gem made by Daimler Chrysler, has had its UK premiere at this year's Mobility Roadshow. 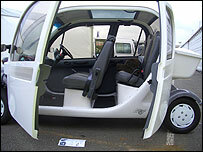 The Gem comes in either a two or four-seater version and has a range of about 40 miles between charges. The UK importer, ZEV Ltd, is confident of selling about 350 Gems in the next 18 months. "The main advantage of this vehicle is that the whole-life cost is incredibly low," ZEV's managing director, Alex Bamberg told BBC News Online. "You're talking about 0.25p a mile to run it, while a petrol vehicle costs around 30p a mile." After paying a one-off registration fee of £38, the Gem will be exempt from road tax. The car will also be free of London's congestion charge and, according to ZEV, many boroughs will allow free parking in meter bays. ZEV is keen to highlight the car's accessibility features, hence its debut at the mobility roadshow at Donnington Park - an exhibition of various transport-related products aimed at disabled people, which ends on Saturday. "The Gem has a 1.5m door opening, it's quite low to the ground, has great headroom and space to move around," said Mr Bamberg. "It has the ability to carry a wheelchair on the back and it's pretty flexible." 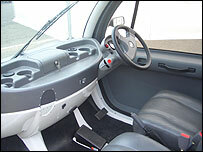 The company says that the car can be made more accessible by adding features like hand controls. The two seater version will retail for just under £7000 while the four seater will cost £1000 more. There are also short and long pick-ups available at a similar cost to the saloon. The car can be supplied with a range of coloured body panels, and the doors can easily be removed in a matter of minutes - features that are likely to appeal to image conscious city dwellers. Although a right-hand drive option is available, left-hand drive is standard which will mean that disabled drivers will be able to get behind the wheel from the kerb-side. 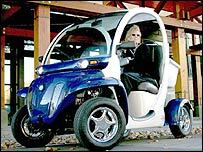 With a top speed of about 30mph and a charge time of seven hours, it lacks the flexibility of a fuel-burning vehicle. But if the majority of journeys are short and predictable it may well find a market among environmentally conscious motorists. Can the Smart car move America?